The Webmood gives you a visual glimpse at the mood of the blogsphere. Beginning with the question, “How might we see how the web is feeling?”, Webmood is designed as a web version of the classic moodring. It uses data mined from blog sentences containing the word “feel”, as in “I feel ______”. 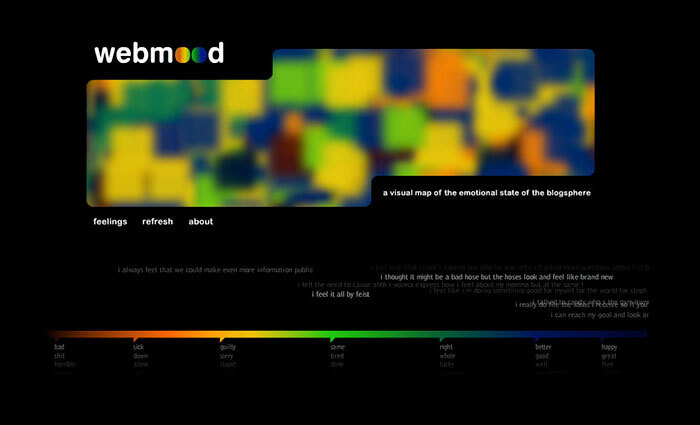 A color is assigned to the feeling and displayed in the Webmood viewer. The site uses an api made available from Jonathan Harris’ and Sep Kamvar’s “We Feel Fine”. So, how is the web feeling today? Check it out.